I must first of all start by saying a lot of unprecedented praises are always been heaped on Lagos state for reasons I find it hard to understand. While looking at Lagos from the outside as a local Ibadan boy, I was full of admiration of the commercial capital of Nigeria. I loved the way Lagos was represented in the movies and mostly songs by music artistes as they all sang about where they grew up. I admired the way the addresses of several companies in Nigeria carried the Lagos tag as they were mostly headquarted in Lagos state. As a student of the Obafemi Awolowo University then, a lot of course mates and room mates told me mostly 'lies' about Lagos. Yes, I purposely called them lies because events were highly exaggerated. Now, I am in Lagos now struggling to adapt to the rigour of activities here called ''the hustle''. Don't get me wrong, Lagos is a great place with an enabling ground to horn your skills, talent and develop into greatness. On this piece, the Village Town Crier will be picking on the amazing state of affairs in the Lagos buses. I have experienced several bizarre occurrences which I have decided to create humour out of. As usual, you see the buses looking so tattered, old, unkempt, overused and adjusted seats (to create more space for increased profitability), faded black and yellow paint, stressed vehicles engines constantly smoking, dangerous-looking bus drivers and their conventionally lousy conductors who will never buy the needed megaphone to practice their trade. These set of people have a way of testing the faith of Lagosians. They are mostly christians. As you board the Lagos bus that never comes to a halt completely, struggling to find a seat at a very tiny spot in between people, stepping on toes and apologizing simultaneously as you sweat from the short struggle, you hear one voice from behind proclaiming the ''Good News'' of Jesus Christ. As the high peach of the voice is maintained, you find it annoying and irritating, one part of you prompts you to cut the preaching short by cautioning the preacher but out of the fear of appearing to revolt against God, you stay calm and patient with the hope that it ends soonest. Its almost unbearable when the person is sitting beside you with the loud voice protruding through your ears. This class is mostly dominated by the Igbos and Yorubas. They are highly controversial. You can never please them. They frown their faces terribly as soon as they sight the black and yellow bus. The bus conductor who is like an attendant in the bus (for the sake of foreign readers) understands the nature of such people. He immediately takes a defensive position. He screams at the top of his voice saying; "Enter with your change oh" No Change oh" "I nor want wahala" These set of people are ready to flare up at the slightest provocation. Their moody look gives you the impression that you are in danger. Stepping on their feet in the bus or over-leaning on them due to the lack of adequate space in the vehicle could attract a death penalty. I am not exaggerating. Some of them purposely attempt to beat down the transport fare which they know its impossible just for the purpose of raising tension in the bus. They pay the bus fare with utmost bitterness and demand for their change immediately like they anticipate a foul-play from the conductor. Even if their change remains an amount as low as N5, they are ever ready to shake up the bus and abandon their destination to recover what rightfully belongs to them. I hereby tender my apology to say that I see the marketers as very weird people. They are mostly of two categories, some sell varieties of items ranging from Sausage rolls to La casera or Viju milk drinks, recharge cards and other consumables OUTSIDE the bus which is highly acceptable in Nigeria and Africa, even though I have never been outside my country lol. The second category have no destination, they will board the vehicle with you. They are mostly rickety and hungry-looking old men with the appearance of a secret herbalist capable of causing maximum collateral damage spiritually. They will not take a seat in order to gain the advantage of addressing the passengers. They mostly sell drugs that are reportedly capable of 'curing' ailments world-class scientists are almost giving up on like Hepatitis, Sickle cell anaemia, Hiv, cancer and the likes. The amazing point is that, their appearances give you the impression that they may have a combination of all the ailments they claim to cure. As you settle down in the stuffy Lagos bus with every passenger giving you this kind of hostile attitude due to the frustrations and stress of the day, you will shockingly hear the cracked voice of one old man wearing a T-shirt that is big enough to be a bed sheet, shouting on top of his voice to advertise a drug or any other commodity. This worsens the already poor state of the bus. A times I feel so strange that this kind of weird occurrence paints the scene of a movie shoot to me. This class of people contains the enemies of the conductors. They look as peaceful as a dove. They are not easily noticeable. They enter quietly with the purpose of also leaving the bus quietly without due payment. The bus conductor stretches his neck at the risk of a possible dislocation to fish them out. Most of them are experts in this field. They will keep a straight face while others are paying for their transportfares. At the bus stop, they exploit the opportunity of the rush out of the bus to innocently sneak out with the alighting passengers. It hurts that so matured men who are old enough to govern a country are in this act too. The act of sleeping in a commercial vehicle used to be so strange to me but when I came to Lagos. I soon realized it was almost normal. Sleeping in a Lagos bus is almost as unsafe as a soldier sleeping at a war front during an attack. Anything could happen, the moment of sleep comes swiftly likes its diabolical. This is due to the fact that some people leave their houses as early as 4am in the morning to reach their working place at 8am due to the bad traffic. This is what happens when you are living in a place like Akute and Ikorodu which is virtually a part of Ogun state, and you are working on the Lagos Island. The same set of people return home as late as 11pm in the evening or later than that. You can't cheat on nature, you will certainly sleep off willingly or unwillingly. Surprisingly, these set of people are so accustomed to sleeping in the bus that the bus has become their bedrooms, two minutes after entering the vehicle, they are already off to the dreamland. Shockingly, I also see some policemen sleeping in their patrol vehicles. That is totally unacceptable. God is our greatest security operative in Nigeria anyway. These people are like cheats. They are like the politicians while slim people are the masses. Mostly plus-sized women with gigantic backsides that could be compared to a contruction truck. Some chubby women will innocently occupy the space of three people in a bus leaving the others being almost squeezed out of the bus. This causes regular fracas in Lagos buses day in day out to the extent that only the affected people complain. The unaffected passengers tend to stay out of the argument because the next bus could entangle them in the same predicament. Its a rotational syndrome. Lagos passengers could be so gross, you will hear the backside being directly attacked verbally. On one occasion, one lousy Igbo man who felt cheated by a fat passenger looked at her 'truck' and said ''Una where u see this ur nyarsh from?, una biko the thing too big, na die oh!" The woman looked at him and angrily said ''Na ur mama you dey follow talk'' As usual, a movie was shot from that scene lol. These are so unwanted like virus-infected files on your computer. These people could make a highly esteemed person in the class of the Governor of a state embarrass himself publicly. These set of people enter solely to steal from targeted passengers. Your phones and wallets are commonly their targets. A friend of mine was rocking a song on his newly bought Iphone 6 with the aid of an earpiece. The phone was safely placed in his pocket and he nodded his head simultaneously to the beat of the songs. He boarded the bus with the normal conventional hot rush common with large crowds. He noticed the song stopped playing, he ignored it and tried settling first in the vehicle. Few minutes later, he tried to change the song, shockingly the phone had already developed wings and probably flown to an unknown tree to relax. He starred at his earpiece with tears welled in his eyes. Behold, it was like a temporary moment of madness for him. When you see the women, you will know the hustle is real in Lagos. With due respect, they are not they kind of people you will want to sit with one the day you are wearing your best cloth to work or probably a very clean white shirt. They are very dirty people due to the nature of their jobs. They have this natural fragrance that is unique to them. Personally, I feel it is the greatest scent ever existed. The smell is a combination of crayfish, dried fish, fresh fish, dried meat, vegetables, dirty clothes, onions, armpit smell, mouth odour and sweat from stress. Imagine the combination of all these in one. This is what you directly face when you sit around them. The most annoying part is that they will never keep quiet while in the bus. They always interact with their fellow market women in strange languages sounding like tongues spoken in churches. They come with heavy loads their litter the already deplorable bus. Sometimes you unluckily have one of those filthy loads hanging around you but you politely stay quiet out of fear of offending a suspected witch. The bus conductors have a terrible way of treating them which they will never take personal. This is a minor class anyway. We all answer phone calls in public vehicles especially when a high priority is attached to some callers. In the Lag bus, some people are so lousy with calls. They pick important calls shouting as if they are making an important Public Service Announcement. They go as far as revealing dirty family secrets. Some go as weird as reigning curses through the phone, they express their emotions freely. This act forces some bus passengers to console them in most occasions. I find it uncomfortable anyway. Some ladies pick calls and loudly flirt on phone too. Love is a beautiful thing, we all want love, we are happy that you are happy but I feel your relationship life is private and should be kept private. I was shocked when one businessman angrily told his caller he was heading to the bank to withdraw N500,000. That was an easy way of selling yourself to a potential robber who may not be nursing intention of robbery at that time. Later on, we Nigerians will blame the police force. This class is the ideal class. It is filled with well behaved and good looking individuals. They are always looking neat, wearing nice dresses which maybe out-rightly cheap, they use good phones, smell nice and talk nice with fake accents. A times they almost miss their bus stops due to their inability to shout like a thug that they are alighting especially when the conductor fails to announce. They stay quiet in the bus with innocent looks, they endure the discomfort because it is temporary, they ignore the bus conversations and hold back their laughs no matter how funny because they believe they may be in the bus but they are not of the bus. I hope I forced down that smile out of your strong looks? Thanks for joining me again on this one. Feel free to share the posts with your friends so that the network can grow. This ministry should move to its permanent site this year loooool. 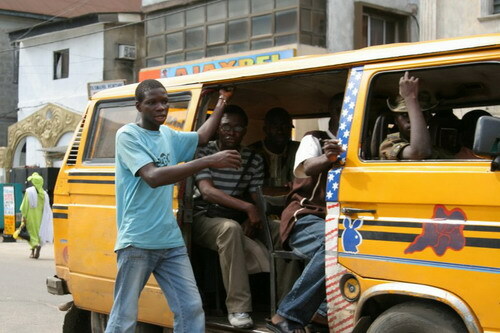 *Hops into another Lagos bus* Orileeeeeeeee! Oyingboooooooooo!! Hold your shangie ooh, na God I dey use beg u oh!! !